The entire book is dedicated to the topic of how to play 3-1 in the first three rolls of the game. There are three chapters: (1) How to play 3-1 in the first roll; (2) How to play 3-1 in the second roll; (3) How to play 3-1 in the third roll. There is also an Introduction, Glossary, and Index of second and third roll positions. The book is based on thousands of hours of computer rollouts, but no actual rollout results are given. "Ballard's and Weaver's original idea was to produce a single book but the quantity of material was such that the concept expanded into a series. In this volume they look at how to play the roll of 3-1 on the first roll, as a reply to all opening rolls, and finally a selection of third roll positions. The book is a learning tool to play the opening correctly and not an encyclopaedia of all opening positions. The innovative page layout may prove to be a new standard. Each problem has a diagram on the top left of the page with the alternative plays, each with their own diagram, listed in order of merit on the right hand side of the page. 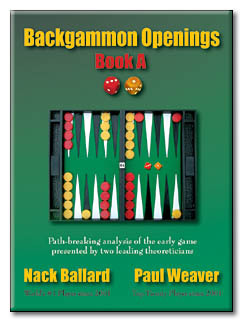 "Most backgammon books published in the last few years have been problem collections, designed to be starting points or contributions to a discussion. Ballard and Weaver set the bar for themselves much higher. They focus on a small but significant set of early game problems, and provide both data and explanations intended as a lasting monument, not merely another brick in the wall. They offer well-thought-out expert explanations of the bot data put into human terms, making this book far more valuable than just its information. COVER: Path-breaking analysis of the early game presented by two leading theoreticians. AUTHORS: Nack Ballard was a teenage chess expert. At 17, he began playing backgammon and became a world-class player within three months. In 1982, Nack won the World Professional Championship in Las Vegas. Two years later, at the US Invitational in Washington, DC, the director polled all the attending experts, who voted Nack the #1 player in the world. During an eight-year backgammon hiatus, Nack became one of the best Scrabble players in the world, maintaining a rating over 2000 until he retired in 1993. He is also one of the top Caucasian go players (5-dan). On the Giant-32 list, Nack has reigned as the world's #1 backgammon player since 2001. Nack has countless victories the world over. His simultaneous multiple event wins at the World Cup and Las Vegas tournaments and three consecutive wins of the prestigious pro-am doubles event have earned him nicknames: "Tiger Woods," "Superman" and the "Executioner." Nack Ballard is also the top color lines player in the world, and an enthusiastic pianist. He resides in the San Francisco Bay area with his lovely wife, Hsiao-Yee. Paul Weaver began playing backgammon in 1978. He has been voted to the Giant-32 list every time since its inception in 1993. Currently he is ranked #16 in the world. Paul has given lessons on four continents. An experienced teacher, he takes a lot of pride in his former students who are now competitive players. As a guest lecturer, he has given nineteen seminars at tournaments in these locations: Buenos Aires, Rio de Janeiro, Copenhagen, Tokyo, Atlanta, Charlotte, Fort Lauderdale, Cleveland and Madison. He has written dozens of articles that have appeared in at least ten venues. Some of his backgammon writings have been translated into Japanese, Danish, German and Italian. An avid traveler, Paul has been in all fifty states of the USA. He has spent a total of four years in forty additional countries and he has played backgammon in twenty-eight. He has won tournaments on four continents. Paul earned a bachelor's at Vanderbilt and a master's at Purdue in math. Also known as Wally Peever, he lives in Hoover, Alabama.